Since the world as we once knew it became 'shattered', Sol has been resting quite a bit with one of his druidic sleeping spells. He's adopted this sort of causal mind-set that things will be what they will be. So why worry about it now? He'll just deal with it as it comes, and he will survive just as he's been doing all these years. He does have two things in mind though for this last week before the Cataclysm. Simple stuff really, nothing special. He'll pay a few more visits to his buddy Baron Rivendare, as they seem to have developed some sort of odd relationship the past couple of months by having breakfast together. There really isn't any love lost between them, but Sol keeps hoping the Baron will show him a little anyway. The second thing is to aquire a drake. The newcomer to the family is a fast growing night elf mage named Alisym. I must admit that she has been having unusual growth splurts with the new quest lines and is now into her early 30's. Her adventures are, or seem to be, always exciting and fascinating to follow. Story-lines, simular to a good book that are difficult to just put down. One gets caught up in them and before you know it, you find yourself a quick 3-4 levels experienced. The stream-lineing of the quests Blizzard has done is great for leveling, nothing seems like a grind so far. Even the trash "kill 10 this and 10 that" hold little surprises. Unexpected knock-backs, fears, silences. She even ran into a kill quest where the mobs used these sort of backpack flame throwers! (does "don't stand in the fire" come to mind here?) 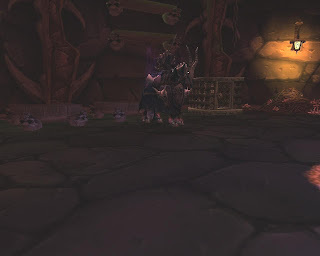 So yes, even at these early levels the mobs are actually fun and I can easily see how these experiences would help a new player be better prepared for end game. 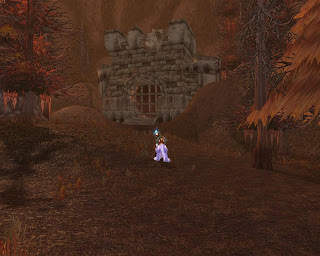 Alisym wanted to share a couple of her early memory pics, these were of her time in Darkshore. Mr. Withers was a delightful surprise reward at the end of a quest chain. When summoned, he starts out nearly as tall as her shoulders, but if you're away from water, he starts to shrink rather quickly! Go near some water, and he grows back to his normal size. This is like, OMGWOW!!! Mr. Chilly can't touch this. Another great thing about the early quest lines is the new level of npc interaction. 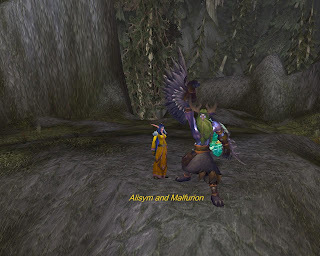 One such quest line led Alisym to work along side of the great Malfurion. And later on, Malfurion even made an appearance during another quest in which she also had the dubious pleasure of meeting Queen Azsura. 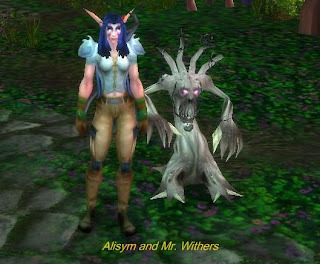 One last note: the Darkshore quests were so enticing, before she realized it, Alisym picked up the achievement for doing 90 quests there. Perhaps there is a Loremaster in her future? Enjoying the new, old world!